1984-85: Gretchen Hayden and her husband, composer and sarodist George Ruckert (disciple of Ustad Ali Akbar Khan) reside in Europe, performing, teaching and conducting workshops in Germany and Holland. Together, they bring Pandit Das to perform in Holland as well. 1985: Gretchen Hayden and George Ruckert reside in Calcutta, while Gretchenji studies and spends time with Chitresh Das’ parents. 1987: Chitresh Das receives the Isadora Duncan “Dancer of the Year” award. 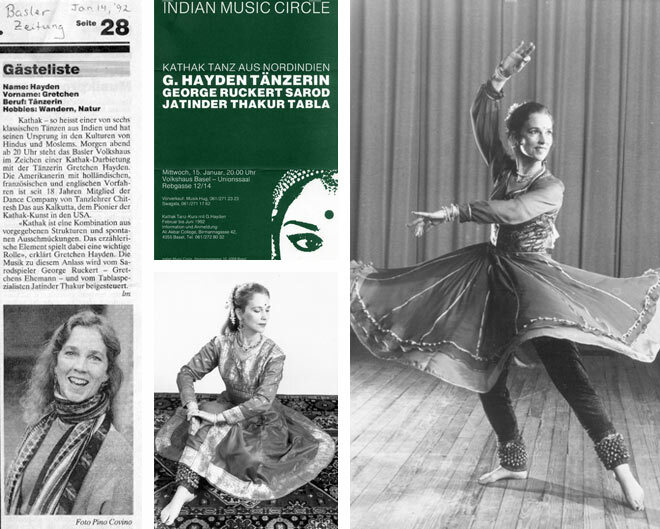 While spending some months in India, Gretchen Hayden receives her senior degree in kathak from the Nritya Bharati Academy. 1988: Pandit Das teaches the first accredited kathak class in the United States, at the San Francisco State University. 1989: The Company is selected by the National Endowment for the Arts to be on its 1989 touring roster.